Bedding begonias are neat, compact plants that prefer dappled shade but will adapt to full sun. They require protection from frost and prefer moist, well-drained soil. They need regular watering in dry weather, especially if planted in a sunny position. 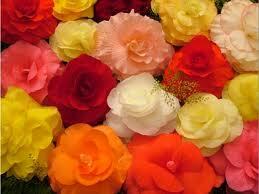 Begonias will last a second season, and can be cut back after winter. Plant from spring through autumn to flowers in spring through to autumn. Will flower 4-6 weeks after planting. Pink, red, & white. Available as straight colours or mixes. Dwarf bedding, edging, massed display clumps in the garden, rockeries, containers, baskets.